In a large skillet, heat the butter over moderately low heat. Season pork with salt and pepper. Raise heat to medium and add the chops to the pan and cook for 7 minutes. Turn chops until they are browned and done to medium, about 7-8 minutes longer. Remove the chops and put in a warm spot. Add shallots to the pan and cook, stirring, until soft, about 3 minutes. Add the stock to deglaze the pan, stir in the mustard, 1 tablespoon parsley, and mushrooms. Season with fresh pepper and cook about 3 minutes, or until mushrooms are done. 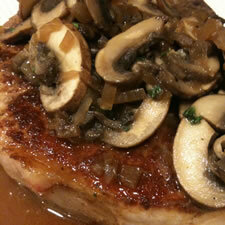 Plate the chops and pour the mushroom sauce over the top of each, then top with reserved minced parsley. Per Serving (per 6 ounce chop): 251 Calories; 7g Fat (25.9% calories from fat); 3g Saturated Fat; 40g Protein; 6g Carbohydrate; 1g Dietary Fiber; 113mg Cholesterol; 480mg Sodium. Exchanges: 5 1/2 Lean Meat; 1 Vegetable; 0 Fat; 0 Other Carbohydrates.